Oceana is that special place where you can let your worries drift into the blue. With an excellent oceanfront location in the exclusive Hatteras by the Sea subdivision, TVs in every bedroom, and plenty of gathering areas and deck space for your family and your pets, this large home has everything you need for your next island retreat. Shoot some pool in the first floor game room for hours of friendly competition. The wet bar with full-size refrigerator, microwave, and icemaker is perfect for poolside snacks. A king bedroom with slider onto the shaded deck shares a Jack-and-Jill bathroom with a bedroom with a pyramid bunk and double bed. The master bedroom features a pyramid bunk set and a twin bed. A half bathroom with access to the covered patio is also on this level, along with the laundry area. 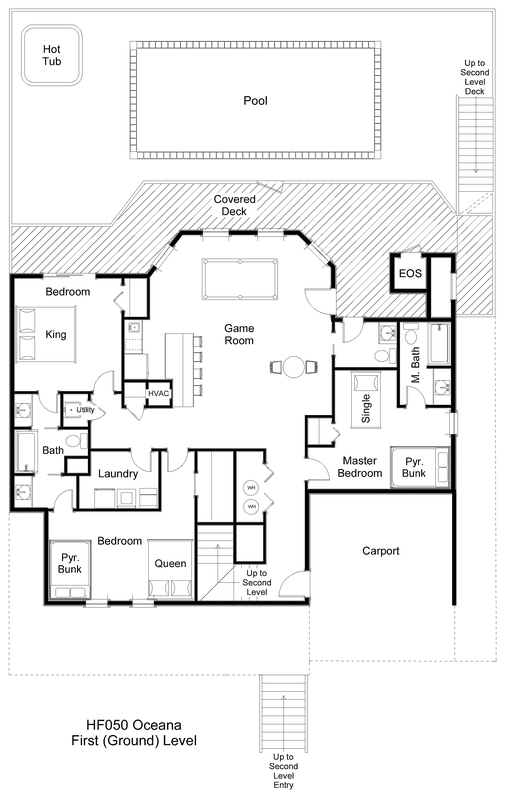 The middle level has four bedrooms and a den with TV and game table. Each of the bedrooms opens onto the wraparound shaded deck. The king master bedroom with shower stall in the bathroom faces the ocean. 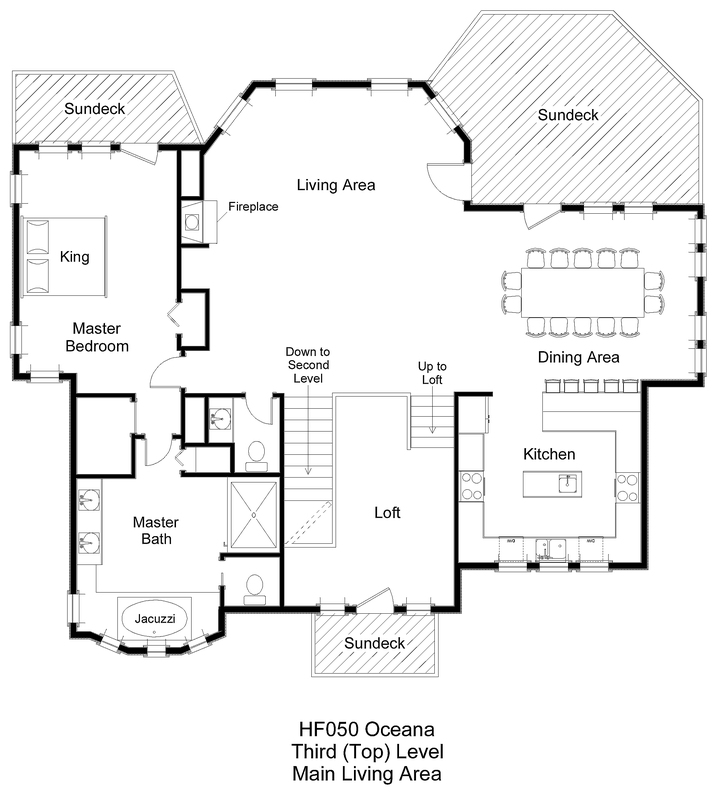 Two queen bedrooms, one facing the ocean, share a full bathroom with shower stall off the den. 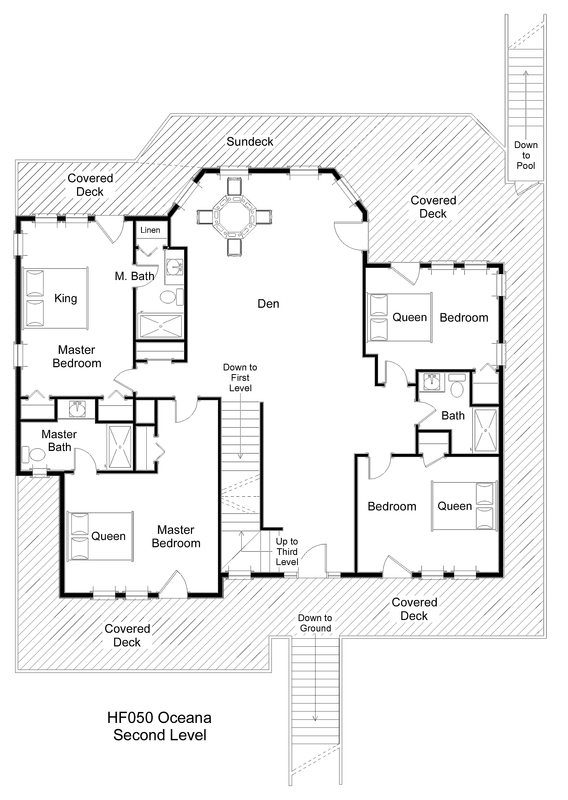 The fourth bedroom is a queen master with shower stall in the bathroom. A king master bedroom on the third floor features a private sundeck, Jacuzzi tub, and large tiled shower. Hang out in the living area with fantastic ocean views, gather around the large dining table, or revel in the ease of cooking for your crowd in the kitchen with dual stoves, microwaves, and dishwashers, as well as a beverage center cooler to keep your favorite drinks chilled to perfection. Take in the ocean breeze from the sundeck off the dining area or get a little quiet time in the loft area with additional sundeck. A half bathroom completes this level. You’ll love the private pool with available heat and the bubbly hot tub. Soak up some sun on the pool deck with plentiful furniture, or take the private beach boardwalk over the dune to have your toes in the sand in no time at all. Charter a boat from the nearby marinas for a day of world-class fishing, or head to Ocracoke on the ferry. From museums to shops and restaurants, there is never a shortage of family fun when you stay at Oceana. I don't seem to be able to reserve Oceana for this week next year. If you try today you should have no problem unless the current guest rebooked yesterday. Current guests have first priority to rebook their week for the following year until close of business on Wednesday of their stay before it goes live to the public. I’m traveling from PA and space is limited. Could you please detail, if any, what beach equipment is available at the Oceana? Thank you! Hello, me and my fiancé are planning our wedding the week of July 25th in 2020. Would there be anyway to check availability for that? Or reserve it or would it be too early? Thank you! You can book a 2019 reservation at any time, but for 2020 reservations, 2019 guests have priority to rent the same house for the same week in 2020. These priority reservations must be made by the close of business on Wednesday of the first week of their stay. Otherwise, properties are released for reservation on a first request basis. Online reservations for 2020 will also be taken, up to 51 weeks in advance. Perfect house for large gathering! Bedrooms are quiet; kitchen is spacious and has everything you need (in most cases, two of everything you need! ); there is plenty of room to accommodate group fun or just a quiet place to read. Five stars! Super easy beach access. Great porch furniture. House was clean and beautifully decorated. Had all the amenities of home to make for an extremely comfortable stay.